Tensegrity is a term used in architecture. The tension of the different parts of the structure gives the structure its strength. Separately each part is a burden on the structure. Together the parts make the structure strong. Tensegrity structures are distinguished by the way forces are distributed within them. 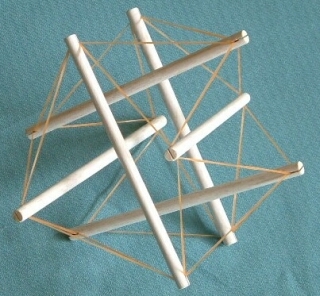 The members of a tensegrity structure are either always in tension or always in compression. The United States has a similar tensegrity. Yeah, hm, I guess. But not nearly as well as it used to, or as well as it could. And not as much at this particular time. However, the author does a nice job of outlining how different elements in society sort of push against each other, to create a more stable system overall. But you spoil the tensegrity if you put too many things in one hat, or make things too one sided. There needs to be a certain equilibrium. 25 Nov 2004 @ 02:20 by grandma218 : Does US Show a Tensegrity Example? Since and as Fuller writes, "Synergetics identifies tensegrity with high-tension alloys, pneumatics, hydraulics, and load distribution, and it is a confluence of optimum factors and the tensegrity system is always the equilibrious-balance phase," I'd like to understand this in vividly clear examples where information is gathered and push comes to shove in our societies. If tensegrity provides the ability to yield increasingly without ultimately breaking or coming asunder, in our democracy who and what play the part as the discontinuous-compression versus the continuous-tension? In order to form a more perfect union in a conceptuality, how many pentagons are too few in respect to this? How many pentagons are essential to show us the aggregate of all the inter-great-circlings that resolve themselves in this regard? Can it be that because the conceptual models of tensegrity are missing from our education curriculums from earliest levels to the most influential representative bodies of law as young minds grow into the governmental constituent field, we are less of a democracy and more of an imbalanced self-empowering legal predator civilization authority playing out its obsoleteness? That is if we want to use the tensegrity analogy in our metaphorical perspectives and not just to play around with word tools and word games about integrity that is obviously missing in our world. Might it be that the synergetic civilization is looking for 12 pentagons as in the pattern of the geodesic tensegrity sphere? Yeah, I don't really think the U.S. is any good example of a tensegrity at all. It is maybe a bit of wishful thinking. Well, of course there are checks and balances in any society, even one that is going a bit crazy. Even in a totalitarian society, there will be other forces than the government, and one can only push so far in any direction. But none of that necessarily ads up to the strength of a tensegrity structure. So, now, I don't actually understand synergetics well enough to imagine what it should look like. I can't get much further than using it as a metaphor and noting that if there are rigid parts there also needs to be flexible parts and they all need to be connected. And if we try to make the whole thing rigid, and we introduce single points of failure, it will be less strong than if there are multiple rigid and flexible elements that hold each other stable, without any one of them holding it all in place. But what are we actually looking for? The right geometry of how many people are in different governing groups, and how many there are of them? Or something deeper, more complex? If you don't recognize the tensegrity it may be because you are too subjective to recognize it. 26 Jun 2006 @ 00:15 by Amber @72.193.101.10 : Tensegrity ? what is Tensegrity metaphor ?